At a recent town hall, a concerned crowd told that there's no new information into the search for the vanishing men from the Village. 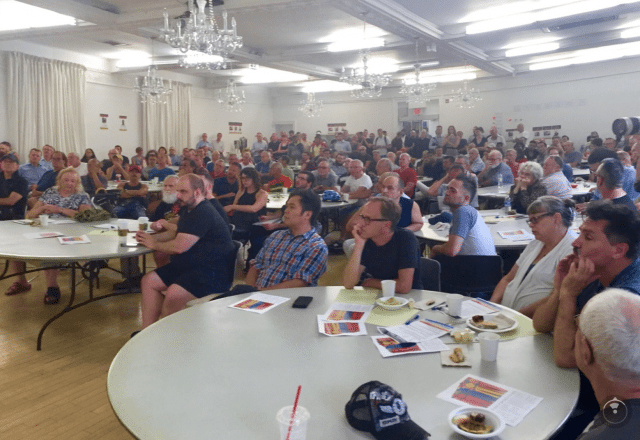 It was standing-room-only at an August 1 town hall meeting discussing the inexplicable disappearances of five men who frequented gay bars in the Church and Wellesley Village and online cruising sites. Friends, family, and community members filled the ballroom at the 519 Community Centre to vent their grief and express their fears about the disappearances that have rocked the community over the past five weeks. 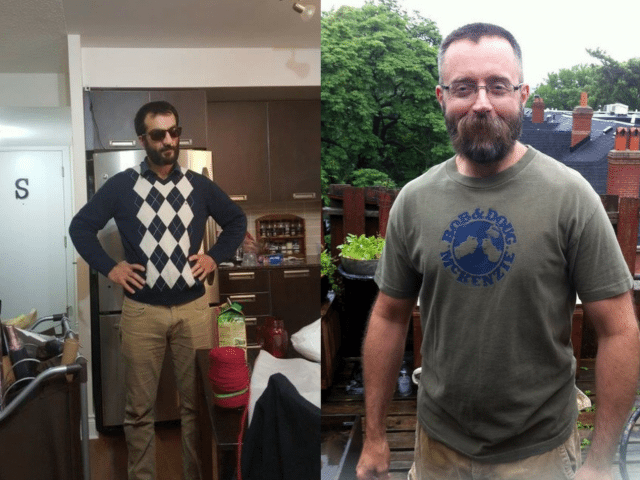 (Left) Selim Esen, 44, last seen on April 14, and (right) Andrew Kinsman, 49, missing since June 26. Photo courtesy Toronto Police Service. The two most recent cases are Andrew Kinsman, 49, who went missing at the end of June, and 43-year-old Selim Esen, who disappeared in April. The other three cases being investigated date back to 2010 and 2012, involving three men of colour. These three men are Abdulbasir “Basir” Faizi, 44, and Majeed Kayhan, both from Afghanistan, and Skandaraj “Skanda” Navaratnam, a 40-year-old Sri Lankan refugee. Last week, Toronto Police announced the creation of a new task force dedicated to investigating the disappearances full-time, and trying to determine if there are any links between the cases. At the town hall, police thanked the local community for their cooperation and “the abundance of information that has come in,” as they said repeatedly. Members of the task force told the community that there are no updates to be released publicly yet. Greg Downer, a close friend of Andrew Kinsman, who founded the group, Toronto’s Missing Rainbow Community Members, and organized the town hall, said the group is developing strategies to stay safe, both while out cruising in bars or chatting online. 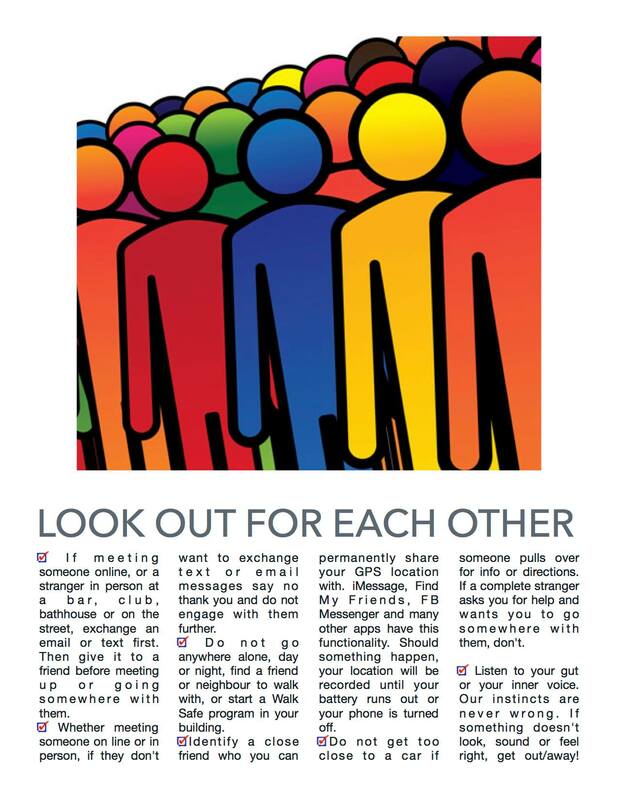 The resource Look Out For Each Other was handed out at the town hall. It suggests keeping a paper trail prior to meeting any online hook-up. That could be initiating an email or text exchange with the online stranger before arranging a meeting. Trans people, Two-Spirit community members, and queer refugees—populations within the LGBTQ community that disproportionately go missing and experience violence—were also invited to speak at the town hall. All spoke eloquently about what it’s like to constantly be vulnerable to violence and subject to random attacks. “Ali,“ an audience member and Iranian refugee to Canada, told the hushed crowd about the time, a few years ago, he had been drugged and attacked by a man he had met on Scruff, and how he still has to take anxiety medicines to ease his pain and his intense feelings of vulnerability. Ali said he went to the police, but was told they didn’t have enough information to lay charges. Trans activist and artist Nicki Ward said many Trans people remain fearful of the police, so many disappearances go unreported. Downer says a priority for the group is making online dating apps safer for LGBTQ people to use. He is already taking steps to reach out and work with to gay cruising and hookup apps, such as Grindr, Tinder, or Scruff, to see if they would consider including an option that allows people to consent to having their information released should they ever go missing. “When you look at the faces of the five men, they certainly have a very similar appearance in terms of what we would call in the community ‘a type,’” Downer said, meaning, they all appear to be middle aged, bearded gay men who are active online and in local gay bars in the Village.